June’s fishing was very good we had some great and fast action . With the weather temperatures being hot we were leaving the dock at daylight to beat the heat and afternoon thunder storms . The Tarpon fishing was on fire a first light in the morning. The Tarpon we have been catching have been in the in 20 to 50 lb range the baits that we have been working the best have been a red and white lucky 13 which has slow sinking action . The Snook fishing has also been excellent this month with the big Snook moving into the passes and rivers to spawn The Snook fishing was on fire. We had several day were we caught Snook the were in the 12 to 20 lb range .The bait that worked the best were live big threadfins and fresh cut ladyfish Redfishg has remained steady this month most of the Reds we have been catching have been along the beaches and oysters bars A slow jig tip with a shrimp or a live shrimp under a popping cork has been working the best most if the Reds we have been catching have been anywhere between 18 and 24 inches with a few bigger one’s mixed in. The Trout fishing has also been good with the best fishing being in the morning before the temperatures heat up .Most of the Trout we have been catching have been over the grass flats in 3 -5 ft of water the bait we been having our best luck with have been a live pinfish under a popping cork or a jig bounced slowly on the bottom . Everglades fishing in May was everything thing it was suppose to be with some great weather the fishing in may was red hot. Snook fishing was fantastic with some great size fish being caught . We caught several nice Snook that top 20 lbs the best baits we had the best luck on were live thread fin herring and fresh cut ladyfish .Mixed in with the Snook were some nice size Redfish . Most of the Reds we caught were on live shrimp under a popping cork . Tarpon fishing was also good in May a lot of the Tarpon we caught were in the 75 -110 lb range .We found the best Tarpon fishing was out in the gulf about a ½ mile off the beach .The baits we had our best luck on were a live ladyfish under a cork. Trout fishing like all the other months this years was also great we had several days were we caught up to 40 trout in a morning . Most of the Trout we caught were over the grass flat in 4 ft of water Trout are great fun to catch and make for a great fish dinner. May fishing overall was great we caught a lot of fish that provided some great action. This winter in Everglades National Parks will go down as one of the warmest in history , and with the weather being hot the fishing has been fantastic. The Snook fishing has been providing us some great action deep in the backcountry, with Snook averaging anywhere from 5 -10 lbs. For the most part, the bait we have been having the best luck on has been live pilchards, which have been available early this year do to the warm weather. Trout and Pompano fishing has also been on fire, with the best luck on the rising tides over the grass flats in 3-5 ft of water. A lot of the Trout we been catching have as big as 5 lbs with a few averaging over 6lbs. The pompano have been mixed in with the Trout and been in the 3-5 lb range . Redfishing remains steady… On yesterday’s charter, the first spot we hit gave us 19 Reds. Over all this month has provided some of the best winter fishing I have ever seen. March is the turn around month for us down here in the Everglades The Tarpon should start showing little by little and be on the bite. A live ladyfish under a float seems to work the best this time of year. Our tarpon here in the Everglades can average anywhere from 75 to 150 lbs. The Snook should start moving out from the backcountry and into the mouth of the rivers and along the island that blanket the coastline. Live pilchards and pinfish seem to work the best this time of year. 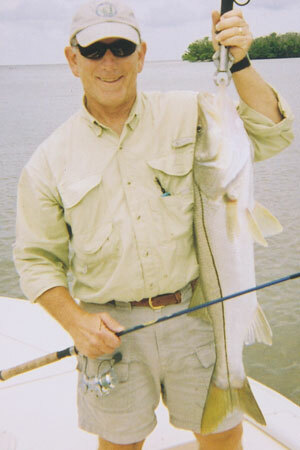 Trout and Pompano fishing should remain red hot right on though the spring, along with continued Redfish action. January Everglades Fishing Report: This January is one of warmest we’ve ever had in S/W FL and with it being so warm the fishing in Everglades National Park has been red hot .The Red fishing still remains on fire we have been having our best luck on the rising tides the bait that has been working the best has been a riptide jig tip with a piece of shrimp. The Redfish we’ve been catching has been averaging between 4-10 lbs. The Trout and Pompano fishing has also been great this month . We have been having our best luck drifting over the grass flat on the high tides. A shrimp under a popping cork has been working the best for the Trout and a small tube jig bounced slowly on the bottom has been the trick for catching Pompano . 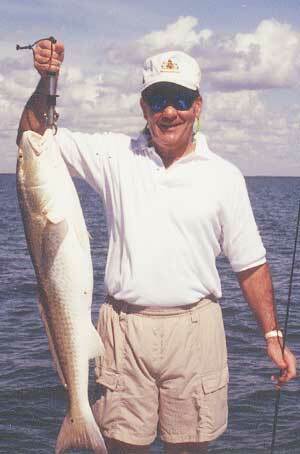 Snook fishing has also remained steady. We have been finding most are Snook deep in the backcountry were the water is warmer. On one of my charters the other day we caught 11 Snook averaging between 5 and 12 lbs. Casting a Zara Spook over the shallow mud bottom has been working the best . On the days were the winds are light we have been running 2-3 miles offshore were the Mackerel have been . Mackerel are one of the best fighting and can provide some great fast action . The Mackerel we have been catching have been of nice size averaging 4-5 lbs. February Everglades Fishing Charter Outlook: With the weather being so warm the fishing in February will remain excellent, with fish on both the outside areas as well as the rivers and backcountry. 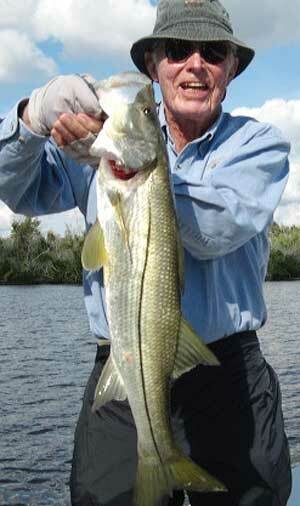 The Snook fishing will still be good deep in the backcountry were the water is warmer and the bait fish are plentiful. The Trout and Pompano fishing will also remain steady on the grass flats Trout and Pompano provide some great and fast action and can make for a great fish dinner. The Redfish fishing over the last 2 years have been some of the best I have seen in my guiding career. 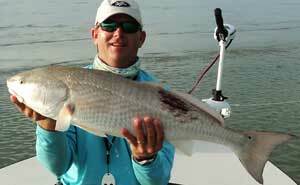 Redfish are a great fighting fish and when we find them school up it can provide hours of great action. Tarpon usually don’t show up till march but don’t be surprise if see a few in February with the weather being as warm as its been. Everglades fishing charters in September started off red hot and finished even hotter. The Redfish fishing was some of the best I have ever seen… They were all over the place and on the bite. We had several days were we caught up to 50-60 fish!! The Redfish we were catching averaged all different sizes anywhere from 18 inch to 35 inches the bait that seem to work the best was live pilchards or fresh cut lady fish. 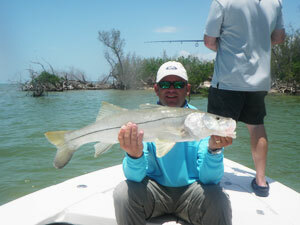 The Snook fishing was also fantastic with the average catch between 23 t0 38 inches. Most of the fish we were catching were along the beach-front on a rising tide, and again on the falling tide around the mangrove islands that had and oyster bottom. Trout fishing also started picking up in September with Trout moving in from offshore and moving up onto the grass flats on a rising tides. We had the some great action using jigs bounced slowly along the bottom most of the trout have been catching have been averaging between 2-5 lbs. My expectations are that October fishing should be just as good, if not better than September. October typically is one of the best months for Trout, and with the water cooling down a few degrees just about every species will be active. Pompano will also start to move in this month and be mixed in with the Trout. The Pompano we catch can average between 2 -6 lbs and are great eating. Mackerel also start to move in this month and can provide some fast and furious action! I would like to thank you for checking out my website.. If you would like to get in some great fishing action please give me a call and book your trip today! Look forward to fishing with you.